Chop one head of broccoli into florets and stalk into 5mm thick coins. Bring a pan of water to the boil and blanch the broccoli for 2 minutes. Drain and rinse in cold water. Sliver the almonds and toast in a dry pan. Chop parsley. Grate the lemon and add the zest and juice to the tahini and mix with the water. Add salt and pepper to taste. Add the toasted almonds and parsley to the broccoli and pour the dressing over the top. 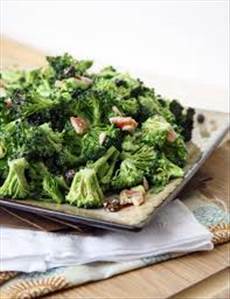 There are 112 calories in 1 serving of Broccoli & Almond Salad. Calorie Breakdown: 61% fat, 25% carbs, 15% prot.